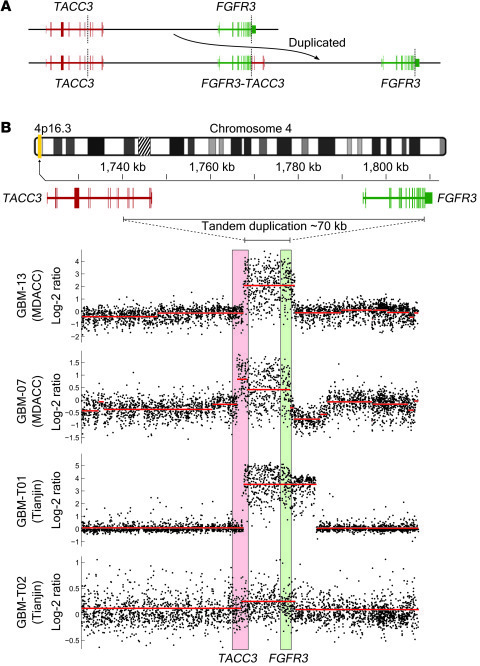 FGFR3-TACC3 fusion is formed by a 70-kb tandem duplication on 4p16.3. (A) Schematic illustrating how the FGFR3-TACC3 fusion gene is formed through tandem duplication. (B) Validation of the tandem duplication in fusion-positive patients using customized Agilent CGH arrays with dense coverage for the fusion locus.